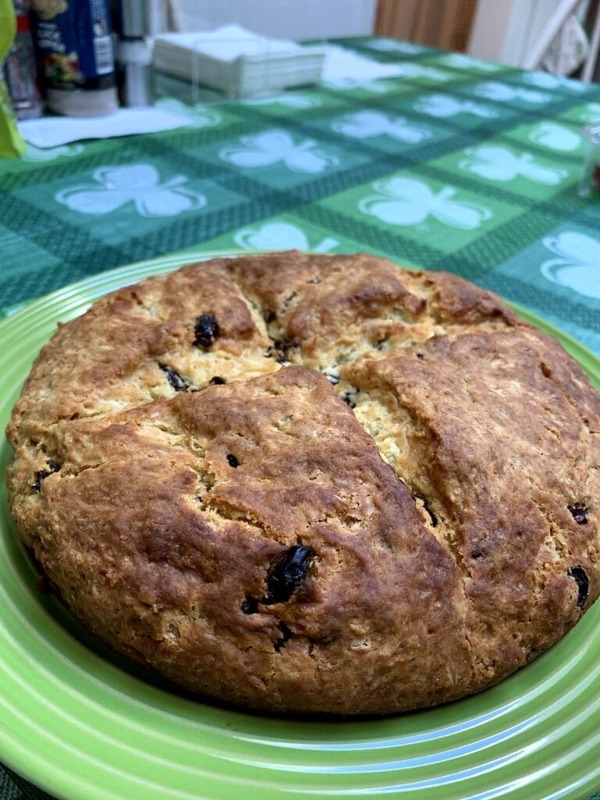 My mother in law makes an Irish Soda Bread recipe with raisins that I absolutely LOVE. I’ve been married for 17 years now and I can honestly say it’s one dish she creates that I look forward to every St. Patrick’s Day season. It’s not your traditional version – where it feels more like a bread. 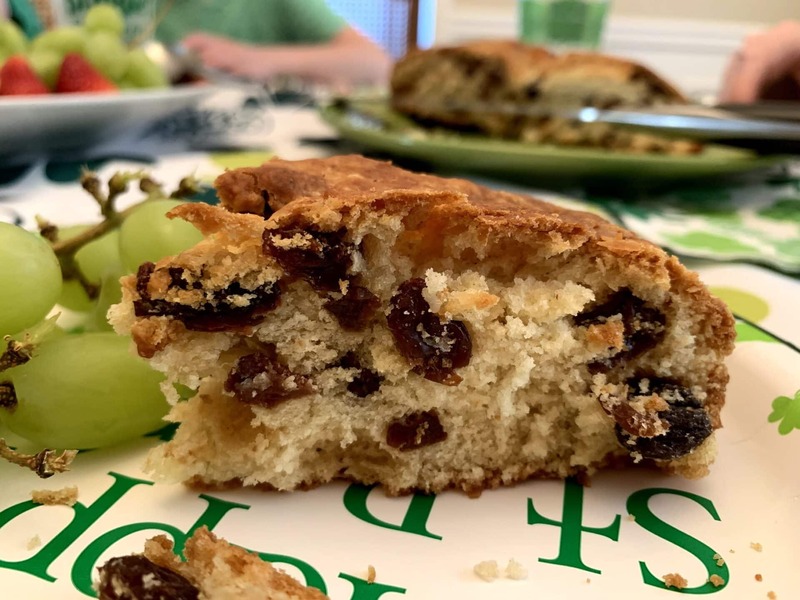 In fact, I would argue that this dish feels more like a dessert because she adds a lot more sugar and raisins than the original recipe calls for. And thank goodness for it! A treat that everyone in my family adores. In order to make this Irish Soda Bread recipe with raisin loaf, you need buttermilk. I wouldn’t suggest substituting it out. Everything else on the list is pretty standard. I don’t have that many bread recipes on my blog. So, this one really stands out for me. I’m so happy that I can finally share this with you and add this to my recipe category because I’ll probably personally reference it a million times on my own! Don’t you just love hand me down recipes? I can’t thank my mother in law enough!! 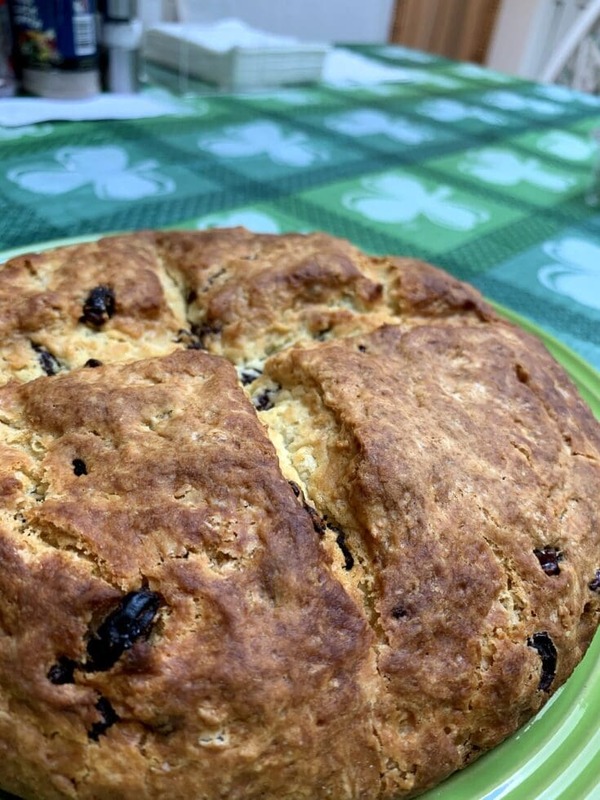 Is Irish Soda Bread Actually Irish? Well, yes! Typically, people in Ireland eat a piece for breakfast with some tea. The history behind the recipe comes from rural Irish households combining soft wheat and baking soda to create the “commoner’s bread”. Yeast bread was really only available for larger city dwellers or commercial bakers. When I first heard the term “soda” I thought it referenced pop or Coca Cola. Hey – just being honest!! But that’s simply not the case. They are talking about baking soda. Makes sense, right?! 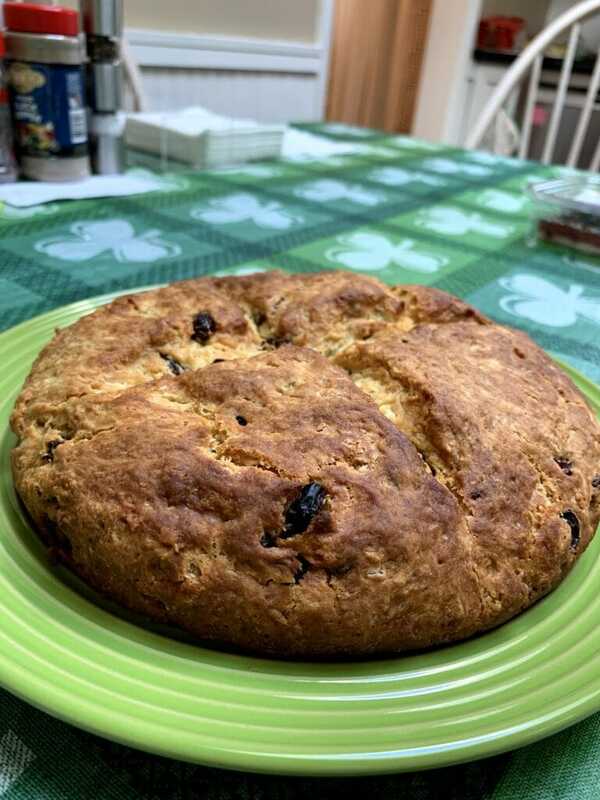 How Long Does Irish Soda Bread Last? Ok, here’s the real deal. This dish is best served the day you make it. Not going to lie!! We usually eat slices of bread for breakfast for two more days and then it’s pretty much over for me. You can get to the third day if you use your toaster oven and slather on some butter, but it’s not my favorite time to eat it because it has lost luster by then. I am a family of five and if I am being honest with you… a bread loaf doesn’t last beyond two days ANYWAY. I doubt it will in your house either. And here is a little secret. I’m not a two serving kind of girl for anything – ever. I try my best to always just eat what I’m supposed to and then STOP. But you know what? I indulge on this dessert because it isn’t really a dessert. It’s not too sweet and that makes it so perfect. I can have it after dinner and then again for breakfast. So, if you need a loaf to last for two days… it will. You can serve your slice warm, at room temperature, or toasted with some butter. Just as a reminder – it really does dry up pretty quickly. So, wrap that puppy UP if you plan on making it last. Don’t plan on it… but if you MUST, wrap your Irish Soda Bread loaf like you are about to throw it into the ocean. You can also try to freeze your soda bread while it is still fresh. Hot off the press (and cooled, of course). That’s a good idea. It actually freezes really well. It will last somewhere around 2 months. Can I Use Low Fat Buttermilk? You CAN use low fat buttermilk as part of your recipe, but try to save your calories another way, my friend! Just enjoy this one as is!! It’s just so good. Trust me. ** A note about the buttermilk – If your dough is too dry, add more buttermilk to it, but do it a little bit at a time. In a bowl, combine your flour, sugar, baking powder, baking soda, and salt. Cut the butter into the flour mixture with a blender. Mix well. Add the buttermilk and mix thoroughly into a soft dough. Add in your raisins. We add a lot more raisins than your traditional recipe and we like it like that!! The sweetness of the raisins really cut the taste of the bread. They truly make it feel almost like a dessert. Add more or less if you’d like. Knead your dough on a lightly floured board for around 3 minutes or until you feel like the texture is smooth. Form the dough in a 7-inch round that is flat. Place in a lightly oiled cake tin. Cut a cross – about 1/2 inch deep in the center of the round. Refer to picture above to see an example. Bake in a 375 oven for 40 minutes. Make sure to keep an eye on your bread. Tops can burn quickly if you aren’t watching towards the end. Cool on a wire rack and serve. 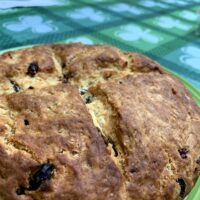 Looking for a traditional Irish Soda Bread recipe that feels more like a dessert? Here's my mother in law's recipe which calls for more sugar and raisins and changes the taste of this dish into something sweet and special. ** A note about the buttermilk - If your dough is too dry, add more buttermilk to it. Be sure to do it a little bit at a time. In a bowl, combine your flour, sugar, baking powder, baking soda, and salt. Cut the butter into the flour mixture with a blender. Miix well. Add the buttermilk and mix thoroughly into a soft dough. Add in your raisins. We add a lot more raisins than your traditional recipe and we like it like that!! The sweetness of the raisins really cut the taste of the bread. They truly make it feel almost like a dessert. Add more or less if you'd like. Cut a cross - about 1/2 inch deep in the center of the round. Refer to picture above to see an example. Bake in a 375 oven for 40 minutes. Make sure to keep an eye on your bread. Tops can burn quickly if you aren't watching towards the end. Cool on a wire rack and serve. So, what do you think? Are you going to give this one a try? I hope you will! 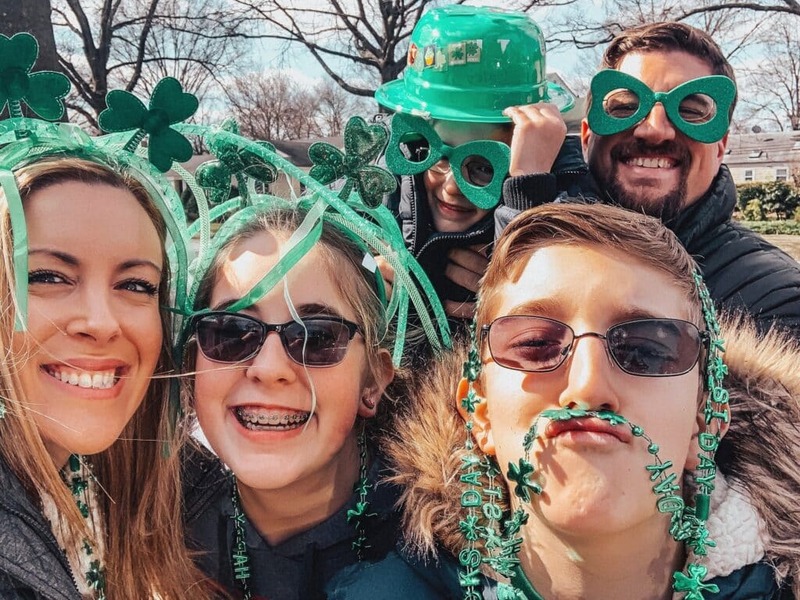 Looking for a kid-friendly recipe for St. Patrick’s Day? Try these Shamrock cookies.